The digital realm returns... This time with an upgraded look! 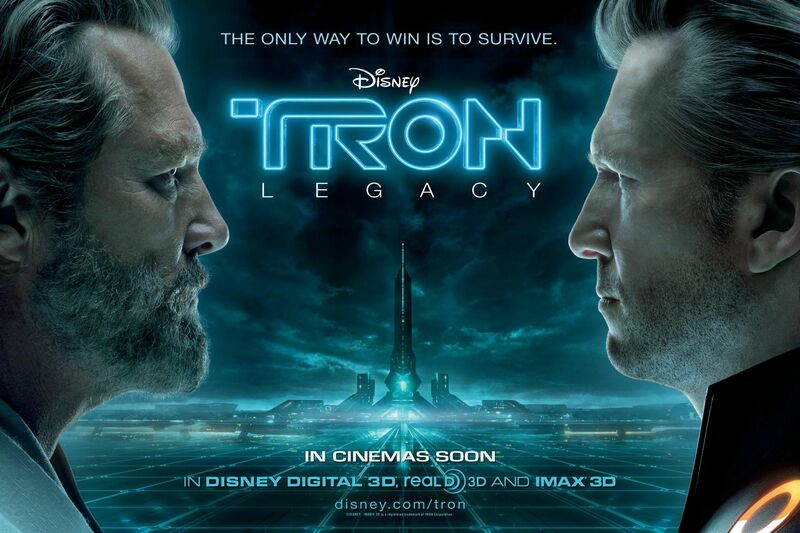 Tron: Legacy is another of those films that you either loved or you hated. Personally I loved it. I was a huge fan of the original, being a part of the first generation to grow with computers in home. I have always had a soft spot for Tron. Tron: Legacy picks up from where the first film left off. Kevin Flynn (Jeff Bridges) is in charge of Encom after the events of the first film. One night in 1987 after visiting his son Sam, he disappears. Moving to 2010, Sam (Garrett Hedlund) is pretty much living the life of a dropout and playing pranks on Encom, even though he owns all of his father's stock. The one night, Alan Bradley (Bruce Boxleitner) receives a page from Flynn's office. Sam goes to there to check what's happening. He stumbles across his father's old workstation that is still running, and accidentally executes the laser that originally digitised Flynn in the first film. Sam awakes to find himself in a vastly upgraded digital world, and is taken to the gaming grid much like father did before. This all leads to reuniting with his father and working out how to get home away from Flynn's own creation, CLU. When the Comic-Con test footage come out, I, like most people, was completely blown away. The light-cycles (one of the best bits from the original) looked amazing, this was always the way it should have been in the original, if the technology was there. And to be honest, when the trailer for Tron: Legacy was released I thought it looked even better. Now when watching the film, the story I had heard was a little weak, and after seeing it I could see why people would think that. It was definitely retreading on ground that had already been done before. But the film looked so gorgeous, and it was an update of Tron. The music is also very notable as perfectly helping to tell the story. Daft Punk, who I have been a big fan of since the beginning of the 2000s, did a fantastic job on making the soundtrack. So much so I regularly listen to it on my iPod. One major problem though was that I found it was being heavily influenced by one film that had already tried to remake the concept, The Matrix. Not many people that I have met, have made the connection between the Matrix and Tron. I always looked at it that both films were switching between the real and digital worlds. And with the later Matrix films, they put more of a focus on programs and other aspects much like Tron always had. The Matrix always had gone for the ultra cool factor in its design, and I feel that this had affected Tron: Legacy too. That and the combat scenes. These really do feel a little bit out of place in a Tron world, although still very cool watching Olivia Wilde in full fight mode. Where this film works best is when it takes concepts like the grid and make it the way it should have been from the beginning. Storywise another problem this time around stems in the concept of the ISOs (Isomorphic Algorithms). This really is never understood by the viewer and never really explained why they are so important as Flynn states. If that had been fleshed out then I think the story could have been improved. At the minute though it feels very much dumbed down and very rushed as there is too much else going on. I would have perferred maybe having this element hinted at more and more rather than only partially explained. It would have made the film's pace much easier to take, and allowed for the future of the series to have somewhere more to go. Right now I'm not sure where the future is as this part was never really explained that much. After watching it a few times though and bearing in mind all of these flaws mentioned, I saw what it truly was trying to do. I felt that Tron: Legacy was trying to be exactly what the original Tron aspired to be. Did it work? Kind of. Elements were superb but the flaws of the original are still present here, the main flaw being visuals over story. I felt it gave as much effort as the original Tron did, and for that I put it on the same level as the original. And combined with the visuals and music, it is a very entertaining film.